Oven-toasted grains deliciously blended with manuka honey, whole nuts and seeds. 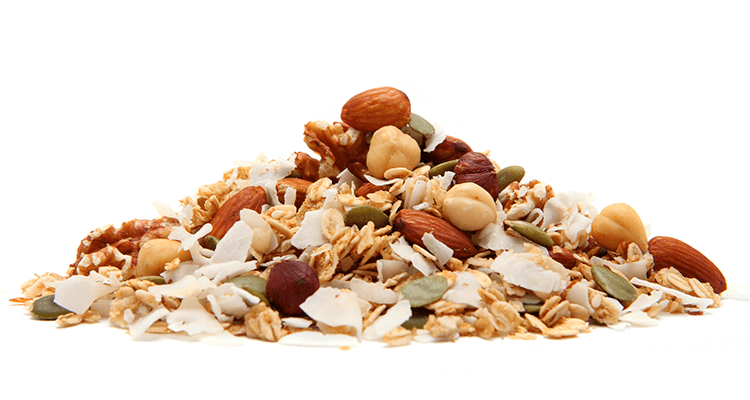 Muesli (Wholegrain Oats, Coconut Chips (Coconut, Preservative (223 (contains Sulphites))), Honey, Brown Sugar, Wheatgerm, Sunflower Seeds, Bran, Sesame Seeds, Sunflower Oil, Natural Flavours), Roasted Almonds (18%) (Almonds (98%), Sunflower Oil), Coconut Chips (Coconut, Preservative (223 (contains Sulphites))), Pumpkin Seeds, Roasted Hazelnuts (8%) (Hazelnuts (98%), Sunflower Oil), Walnuts (8%). Contains gluten, sesame seeds, sulphites and tree nuts. May contain traces of egg, milk, peanuts, soy and other tree nuts.